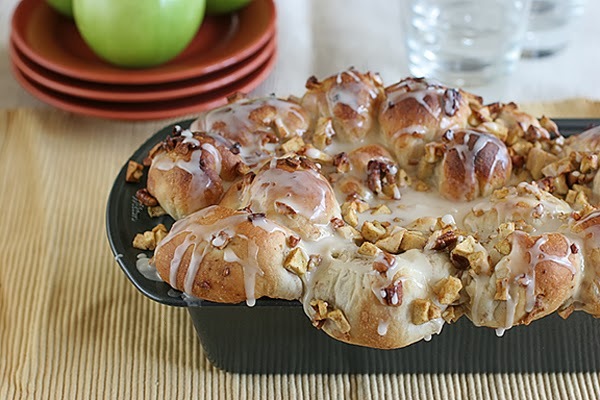 This recipe is like monkey bread, but I think that balls of filled dough make everything so much better! Combine apples, sugar, nuts and cinnamon. Flatten each roll half into a 2-3-inch circle. Place 1 teaspoon apple mixture in center of each dough circle. Pinch edges together to seal, forming a ball. Place filled balls in a sprayed 9x5-inch loaf pan. Spoon remaining apple mixture evenly over the top. Cover with plastic wrap and let rise until double. Remove wrap and bake at 350�F 45-50 minutes. Cover with foil last 10 minutes of baking to prevent over browning. Combine icing ingredients and drizzle over loaf.